So you’ve been out cruising all day, and you pull into the local burger joint to hang out with your buddies. Or, you’ve rolled your bracket warrior through a couple of rounds on a nasty hot day and have it back into the staging lanes, when they make the call for your next round. Neither instance is one where you want to turn the key, or push the button, and have nothing happen. You want your starter to be reliable no matter what the conditions — and that’s where B&M‘s new Star Tek starter line comes into the picture. Just three part numbers cover a wide range of applications — the entire LS lineup from GM from LS1 through LS7, Ford small-blocks from 289 through 351, and Mopar vehicles from 1958 through 1991 with engines ranging from 318 to 440 cubic inches. The starters use 4.5:1 reduction gears combined with a high-power 300 amp motor to ensure the vehicle will start no matter what the combination is. 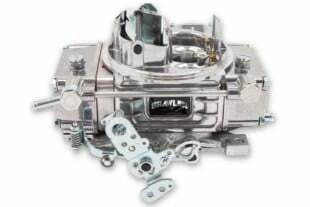 An ultra-high-strength pinion gear, billet aluminum mounting flange, sealed ball bearings, and dual-winding solenoid are standard equipment on all three part numbers.